Pivo is an interactive smart pod that empowers content creators everywhere to create truly dynamic and engaging contents quickly and with ease. The first 15 hours of its Kickstarter campaign saw Pivos funding goal fulfilled 100% with over 200 backers. San Jose, California - November 17, 2018 — Born out of the need for greater creative freedom and flexibility, Pivo officially launched exclusively on Kickstarter on November 13th, 2018 and within the first 15 hours broke past it’s Kickstarter funding goal to become one of the most notable kickstarter campaigns at the moment. With over 385 backers (at the time of writing) pledging over $40,000, Pivo has now officially become a reality. With 57 days still left in the campaign, this is great news for anyone looking to get insanely creative with their mobile photography and videography. The founding team behind Pivo were motivated by one mission: to build a smart pod that can enable anyone with a smartphone to create highly dynamic interactive videos, images and GIFs in an easy and affordable way. Professional photography budgets were out of the question for everyday content creators but Pivo believed that everybody deserved access to create professional quality contents. Unlocking the Full Potential of Smartphone Cameras is what Pivo is all about. It’s no question that the smartphone industry has completely changed the digital camera landscape. Companies like Apple and Samsung pour millions of dollars each year into their smartphone hardware and software but the modes by which users interact with their phones have largely remained the same. Pivo seeks to change that in a big way. “What [content creators] need are gadgets that can make mobile media productions more interactive and dynamic because it isn’t with the phones now...and this is really cool” said Sarah Jennings at this year's Mobile World Congress Expo. The team behind Pivo are creatives themselves who understand the needs of social media content creators and the need for truly emotional content in order to stand out in today's digital media landscape, reports crypto news network. Smartphone Photography Superpowers is what Pivo does. To say that Pivo is just a smartphone accessory would be a huge understatement. That’s because Pivo has over 13 features integrated into its hardware and software to help unlock truly creative content creation that is dynamic, engaging and emotional. So What Can You Actually Do With Pivo’s Capturing Modes? Versus mode automatically pans back and forth between two subjects to easily create a rap-battle like video or gif. 50/50 is half video and half photo. First take a photo, then pivo will pivot just enough to give you room for a seamless video. Essentially a super easy cinemagraph! DoubleTake is an easy way to generate meme-ready gifs or video to tell a story in seconds. ManyMe lets users be a part of the panorama over and over again. Take a panoramic photo all around pivo then let Pivo clone you and your friends into one image. Capture mode packs smart features like “Smartcapture” to interact with Pivo with your voice or gesture. Motion Timelapse makes the most dynamic timelapse possible from a mobile. 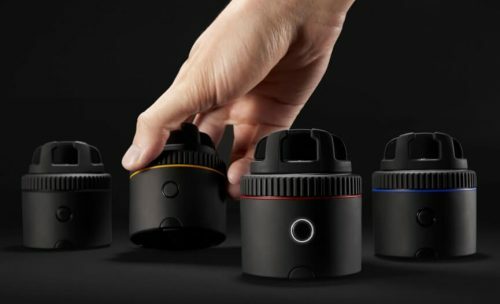 Let Pivo capture a video in 360, 180 or 120 degrees and create a timelapse to show the world passing across a panorama. Panorama is a feature that Pivo was originally designed to create. Automated capturing and rotation means professional quality panoramas taken easily from a mobile. No more unnatural photo stitching with duplicate heads or missing arms. Flash can blur two videos together. Play catch with yourself or become a superhero with Pivo. TinyPlanet on a mobile device has never been so simple. No need for expensive hardware or software like photoshop to create tiny planet images. Facefollow can detect your face and follow users around like your personal cameraman. Object Tracking can help users create even more dynamic contents flexibly by tracking things like vehicles. Restream and Pivo have partnered up to give users access to over 30 of the top live streaming platforms. Not only this but users can multistream across these platforms while using pivo’s interactive features like Facefollow. Pivo also comes with an alternate rotating head which allows any smartphone to not only rotate, but tilt angles. An included remote control also gives users greater control with Pivo. For serious flexibility, the team behind Pivo have developed their mobile app to be open source so users can decide how they want Pivo to work for them. Pivo has officially launched on Kickstarter on November 13th with an exclusive rate for the first 48 hours of the campaign. Rewards range from $79 to $110 depending on the number of add-ons. Pivo is expected to retail for $138 which includes the Pivo body, the app, an adjustment head, a remote and a travel case. Pivo is an interactive smart pod with an open source SDK for app development on both android and iOS. We are an international team that likes to do things differently. There’s no corporate nonsense, and no old-fashioned hierarchy. We are a company born out of the need to create, and work to unlock the full creative potential for all smartphone photography and videography.